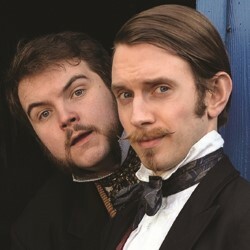 Time travelling magic duo Morgan and West present a brand new show chock full of jaw-dropping, brain-bursting, gasp-eliciting feats of magic. The dashing chaps offer up a plateful of illusion and impossibility, all served with wit, charm and no small amount of panache. Be sure to wear a hat – Morgan and West might just blow your mind. ***** (ThreeWeeks). Buxton Fringe Comedy Award Winner 2013. Here is a taste from their youtube channel. This entry was posted on July 8, 2014 by Phoebe Darqueling. It was filed under Performing Arts, Short Films and Promos, Steam Tour and was tagged with Comedy Genres, Ed Fringe, Fringe fest, Magicians, Morgan and West, steam punk, Steam Tour, Steampunk, Time travel, Travel.